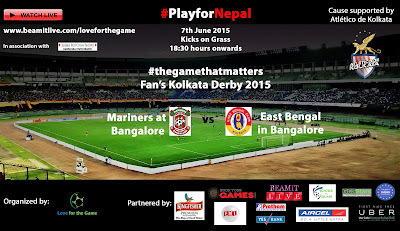 Football in Bangalore: Play for Nepal: Kolkata Fan's Derby in the Garden City! 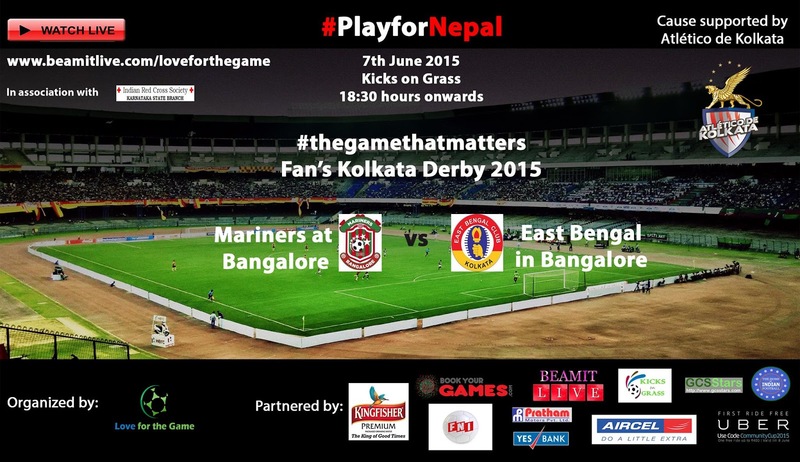 Play for Nepal: Kolkata Fan's Derby in the Garden City! Another football-filled weekend is lining up as the Garden City-based FAN-atics of McDowels Mohun bagan and Kingfisher East Bengal fight for the Fan's Derby, a charity event presented by Love for the Game organized in the memory of Nepal earthquake. Popularly known as the Kolkata Derby, Mohun Bagan versus East Bengal football match is one of the top 10 popular football derbies across the globe. Representing Mohun Bagan is the very popular fans group, Mariners@Bangalore and East Bengal will be represented by East Bengal in Bangalore group. The event will be played at Sunday, June 7, 6.30 pm at Kicks on Grass, Bellandur. The match will be broadcasted live over the internet via www.beamitlive.com/loveforthegame.